Perylene bisimides are organic pigments with interesting dye properties. While these compounds are red in the solid state, when dissolved, they generate bright yellowish-green solutions under UV irradiation. Aside from their optical appeal, organic molecules that appear colored in daylight can also show intriguing electronic properties. Therefore, organic dyes are promising lightweight materials for applicationas organic semiconductors, LCD displays and solar cells. 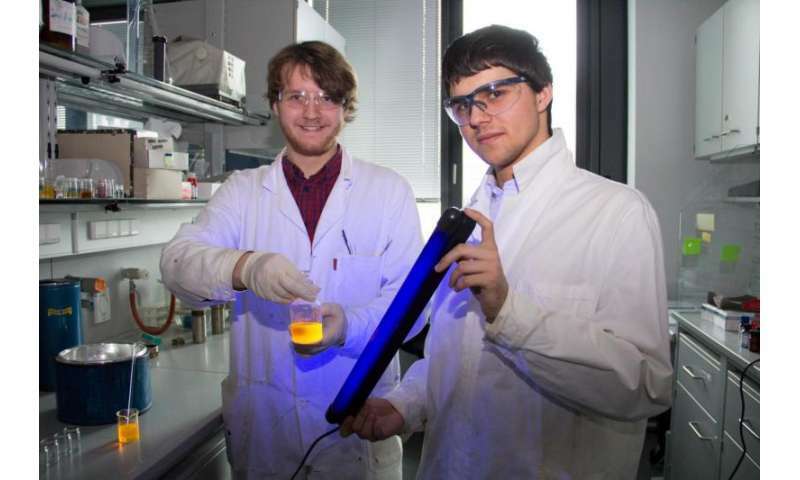 The laboratory of Dr. Miriam M. Unterlass at the Institute of Materials Chemistry at TU Wien has just reported the synthesis of more than 20 perylene bisimide dyes. Conventionally, perylene bisimides are generated in highly toxic solvents employing toxic and expensive catalysts. Classical reactions toward these dyes require an excess of the starting compounds. Normally, lengthy purification is necessary for obtaining dye products of sufficient purity. The conventional route is a complex chemical synthesis. "In our approach, we are using the starting compounds in a 1:1 ratio, i.e. without an excess of reactants. The starting compounds are dispersed in water inside a closed reactor. Then the mixture is heated to 200 ˚C and increased pressure is generated," explains Dr. Unterlass. "In fact, the reactor basically works like a pressure cooker." Such reactions in hot water under pressure are called hydrothermal syntheses. After the reaction has completed, the final perylene bisimide dyes are obtained with high purity, thus removing the necessity for tedious purification. For actual electronic applications, perylene bisimdes are mostly implemented by device engineers and physicists, who often do not have access to chemical laboratories. The novel hydrothermal synthesis bears the potential of enabling an easy access to these materials – an important step towards realistic application. Previously, Miriam Unterlass' team had developed a novel process for high-performance polymers, which equally takes place in hot water. The hydrothermal synthesis of perylene bisimide dyes now shows for the first time that small molecules can also be generated "in the pressure cooker." Normally, novel synthetic pathways are first developed for small molecules – which are often easier to conceive – and later transposed to polymers, i.e. "big molecules." Despite their small size, the hydrothermal synthesis was challenging. Perylene bisimides are apolar at room temperature, which means that they do not like water. By heating the water to increased temperatures, this challenge can be overcome. The hydrothermal synthesis of perylene bisimides is highly efficient and environmentally friendly, and has just been published in the journal Chemical Communications.